Command Central has the honor of an extra-special guest – fellow Commander Jeff Maginniss. He’s our in-house spreadsheet connoisseur, he’s feared by Zheng-Shi, and he’s a great guy all round. Let me take this opportunity to welcome you here to COMCEN, CEO Maginniss and ZERO-ALPHA Commander. It is really good to have you here with us today! 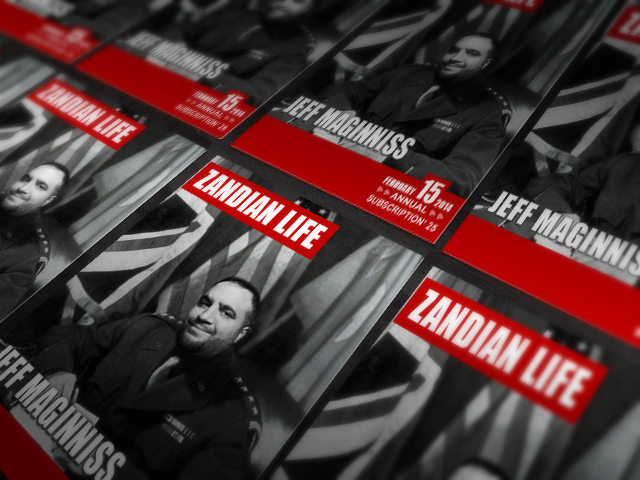 Mr Black: Commander Maginniss, you more than most people know how tough it is on the Zandia Front. We’d like to know: what is it that keeps you coming back for more, day in & day out? There’s so much mayhem out there; how do you keep forging ahead in the face of unrelenting danger? What is it that keeps you going? Jeff: Well now Mr Black, it’s all about the challenge. I’m not one to back down from a challenge. Let me start by saying that this is not my first foray into the dark and dangerous world in online gaming. I was an avid player of subscription-based games back in the day. I’ve got a well-documented history in PC and console games, since I worked as an editor for a top-tier gaming website. I must say that Soldiers Inc is definitely a W.I.P. (work in progress) and I relish the idea of seeing this game play out! I am particularly impressed by the sheer attention to detail in the game; the voice acting is superb! Let’s not forget the concept of the game and the artwork are best-in-class. But what really strikes me about this game is the fan base. There are scores of players lining up to enjoy Soldiers Inc™ and that’s something I want to be a part of. Mr Black: You’ve nailed it there Commander! That old cliché really is appropriate here: There’s no ‘I’ in TEAM! That’s for damn sure. Do you mind if I call you Jeff? I have been following you so closely in the Forum that I feel like I know you already. So regardless, I’m calling you Jeff. What’s your daily routine like Jeff? Jeff: That’s A-Okay with me, but I’m calling you JB. Truth be told, I spend lots more time than I should in my base. But that’s okay with me because I’m online all day long. I’m always battle-ready and there’s always action in the background. I typically conduct radio-checks and recce’s on a regular basis – just to be sure that everything’s as it should be. Don’t want any infernos or problems with the Combine. Correct! Let’s cut to the chase, shall we? What’s the END STATE? What is your Course of Action? Put simply: What is your Strategic Plan, Jeff? I’d like to know what your objectives are. Jeff: That’s an easy one for me to answer JB. I am really impressed by the team aspect of the Combine. If I’m not focussing on developing my Combine from the inside out, I’m always looking for ways to partner up with allies, or even to capture territory if it’s strategically safe to do so. Nothing is decided in a vacuum. I discuss all of our strategic decision-making processes with fellow command ranks; we’re looking to maximise our decisions and generate the best outcomes. I’m not averse to getting input from new recruits either. This is how I get insights into the objectives that we’re formulating and executing. Mr Black: Now that’s what we call Mission Command and COA Construction! Commander, I must confess that I really like your style. When everyone in the team has a voice that is heard, you’ve got a great team. That’s how it was for me back in the day…but let’s not dwell on my stories; back to you Commander – who are your ongoing enemies besides Zeng-Shi? I’ve got a sneaking suspicion that you’re a Chi type of Commander – like those sniper lads I had the pleasure of knowing in the good ‘ol days! Jeff: Well, to be honest with you JB my Combine and I are pretty much at peace with our surrounding neighbors. Make no mistake though; there were many instances when I witnessed lots of change on the Combine map. These threats could have devastated our Mining Complex core. But, we threw caution to the wind and used pre-emptive strikes to hit the enemy targets. Needless to say – we took them out. With every victory, we reach a higher level of camaraderie. That’s what it’s like in the crucible of combat! Mr Black: There’s nothing like a firefight to get the troops amped! I too have experienced that glorious feeling – many times. Right! Let’s move it alone shall we. Future Ops: what can we expect from you Commander? Jeff: I firmly believe that a strong Combine is where it’s at. That’s my focus. If I can continually strengthen my core and lead by example, then new players will be better suited to fulfilling the needs of the group. It also makes it easier for them to forge new alliances with Combines in our vicinity. I’m hoping to find someone with the requisite skills who can program my tools into a website so that they are easily accessible without using Microsoft Office Excel. Programming skills are not my forte! Jeff Maginniss explains Training Phase V! Jeff Maginniss explains how to achieve Maximum Depots!